Not a cloud littered the sky over Arizona’s Grand Canyon West. The land’s native Hualapai people had gathered for a musical blessing, as press from far and wide stood alert. Everything seemed to be falling into place for the US debut of Breitling’s Jetman, Swiss pilot and daredevil, Yves Rossy. There was just one problem: the FAA. Rossy, the first human to achieve sustained human flight, is the creator of a fixed-wing “jet pack” that rockets him through the air at speeds of almost 200 mph. Using no more than subtle body movements to control the carbon fiber craft, the Breitling-sponsored pilot is known all over Europe for his numerous stunts and appearances. Chasing a dream to bring his unique form of flight to the US, Rossy has been scouting out the Grand Canyon, and had planned to fly over the span May 6, while a crowd of tourists, Native Americans and of course, media, cheered in disbelief. The hang-up, however, all centered around just how to classify the airborne Rossy. Starting each flight as a skydiver, the Jetman becomes well, a jet-man, mid-flight, and then finishes as a skydiver once again, parachuting to Earth after his rockets are exhausted. Eventually the FAA did grant Rossy permission to cross the canyon, but not until a crowd had gathered, leaving him no time for a practice run. Choosing to play it safe for the press—and understandably himself—he scrapped the plan; but not for good. Yesterday, Rossy took advantage of his FAA clearance, launching from a helicopter at 8,000 ft. into the open blue sky. 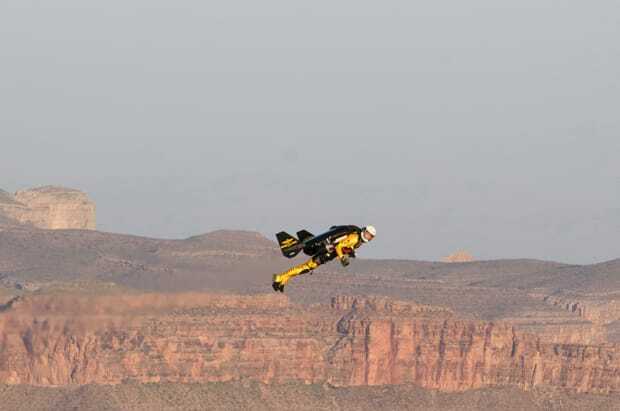 At speeds up to 190 mph, the Jetman skimmed over one of the US’s most famous natural creations for over eight minutes, before parachuting to the canyon floor. "My first flight in the U.S. is sure to be one of the most memorable experiences in my life, not only for the sheer beauty of the Grand Canyon but the honor to fly in sacred Native American lands," Rossy stated. "Thank you Mother Nature and the Hualapai Tribe for making my lifelong dreams come true."